Robust and powerful 500W motor. Extremely compact for working in tight spaces and overhead. Low weight of only 1.5kg for fatigue-free working. Rotating brush plate for constant power in reverse and forward rotation. To make a hole of different size in solid substance i.e. wood, steel & concrete. Bosch 500W Professional Impact Drill with 5 Pieces Drill Bit Set, GSB 501 is a premium quality Power Tool Combo from Bosch. Moglix is a well-known ecommerce platform for qualitative range of Power Tool Combo. All Bosch 500W Professional Impact Drill with 5 Pieces Drill Bit Set, GSB 501 are manufactured by using quality assured material and advanced techniques, which make them up to the standard in this highly challenging field. The materials utilized to manufacture Bosch 500W Professional Impact Drill with 5 Pieces Drill Bit Set, GSB 501, are sourced from the most reliable and official Power Tool Combo vendors, chosen after performing detailed market surveys. Thus, Bosch products are widely acknowledged in the market for their high quality. 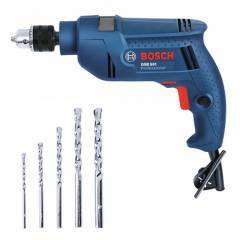 We are dedicatedly involved in providing an excellent quality array of Bosch Power Tool Combo. Dispatch time is good and product delivered is original. Drill is functioning good.